An intriguing blending of film forms wrapped around a compelling story that’s part art heist and part relational tragedy. I found this mix really appealing for many reasons. The film begins with what seems like the ubiquitous title card, but with a twist. “This is not a true story” appears on screen, then “is not” is wiped away. We soon find that both things are true. What follows is a combination of narrative fiction and documentary, and really less a blending of those forms than a hopscotching between them. We are slowly introduced to the four main characters (well portrayed by actors Evan Peters, Barry Keoghan, Blake Jenner, Jared Abrahamson) in a narrative style, intercut with doc style interviews of the real people the characters represent and others associated with the real events. This back and forth would seem confusing on paper, but it works, lending a sense of grounded authority to the fictional narrative, but also calling us to doubt the veracity of what some of the real people are saying to camera. It’s an intriguing mix which makes for effective storytelling. Along with that mix of style is also a heist story, with many of the expected tropes of the genre. I appreciate Mr. Layton’s highlighting the humor within that genre, and especially the nod to Soderbergh’s Ocean films with a short sequence, even using A Little Less Conversation by Elvis Presley as its soundtrack. It made me laugh out loud! 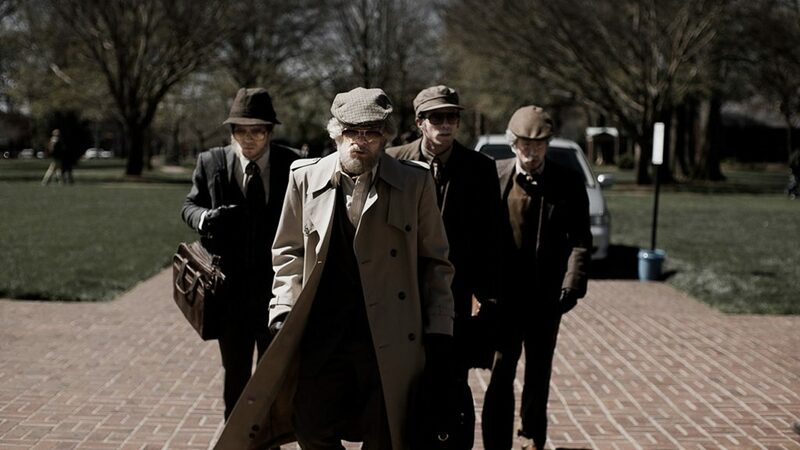 In addition to the style, I was captured by the story of these four college-age guys and their tumble into crime. How it all happened, despite the variety of each’s version, seems generally clear. What Layton allows to stay muddy is the defining reasons for the choices each of the four make. Was it primarily hubris that they could accomplish the theft, boredom over the banality of their lives, foolishness from what are essentially fools, or perhaps a combination of all and more? It’s a satisfying telling of the tale and the unanswered questions make it have more weight than just entertainment. What we do know for sure is that their fantasy did not match reality, their foolishness undid them (to the tune of seven years in prison, each), and they really hurt people, both the innocent and their families, who we see shocked, befuddled and moved to tears by their sons’ escapades. It’s hard to feel too sorry for the four, since they seemed to have gotten what they deserve. It’s quite another matter to accept how their choices hurt those who love them. Should See. This entry was posted in Cinema and tagged Barry Keoghan, Blake Jenner, Cinema, Evan Peters, Jared Abrahamson, Should See.